All through the bear market hopeful rationalizations were served up for a bullish case on the gold miners. All through the bear market we warned people not to eat that rotten turkey! China demand, the China and India “love trade”, cyclical inflation driving up the prices of commodities and resources and the classic… economic growth in the US will create cost-push inflation through wage increases with the smart money seeking inflation protection in gold. All of those and a veritable Turducken of mishmashed ingredients were served to gold bugs as a decidedly not delectable appetizer before the main course. But with a top in risk ‘on’ global markets now finally including the US (pending any holiday relief bouncing), the planets are aligning per the fundamentals that matter. This will drive up gold’s relational price to cyclical risk ‘on’ assets and improve gold mining bottom line operations (reducing miners’ costs per ounce of gold produced). The sector will also be more appetizing to a much wider range of investors, now that their perceived sure things in the FAANGs and other momentum fueled, ‘can’t miss’ areas (like the Semi sector, which we warned on long ago: Semi Canary Still Chirping, But He’s Gonna Croak in 2018) are no longer working. 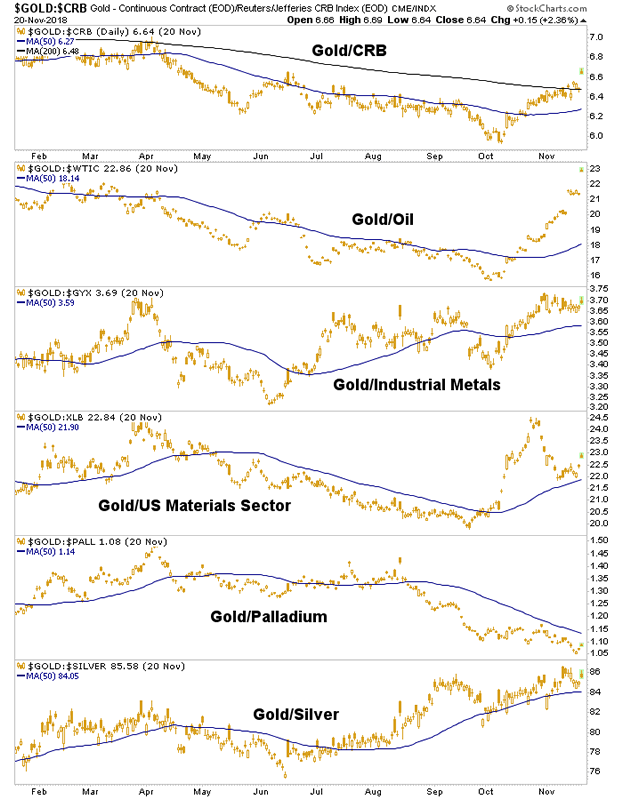 Sector fundamentals are represented by gold vs. commodities, and in particular vs. energy and materials. These are where gold mining can see improved margins as product is marked up in price in relation to costs. Gold is currently bullish in all items below except for Palladium, which is being moved by its own discrete (i.e. non macro) supply/demand issues within the auto industry. Gold/Oil, Gold/Industrial Metals and Gold/Materials are on the signal gold bulls awaiting proper fundamentals would like to see. Gold/Silver is a macro indicator and tends to rise with market liquidity stress. A rising Gold/Silver ratio often pressures the miners too so again, patience; it’s a process. 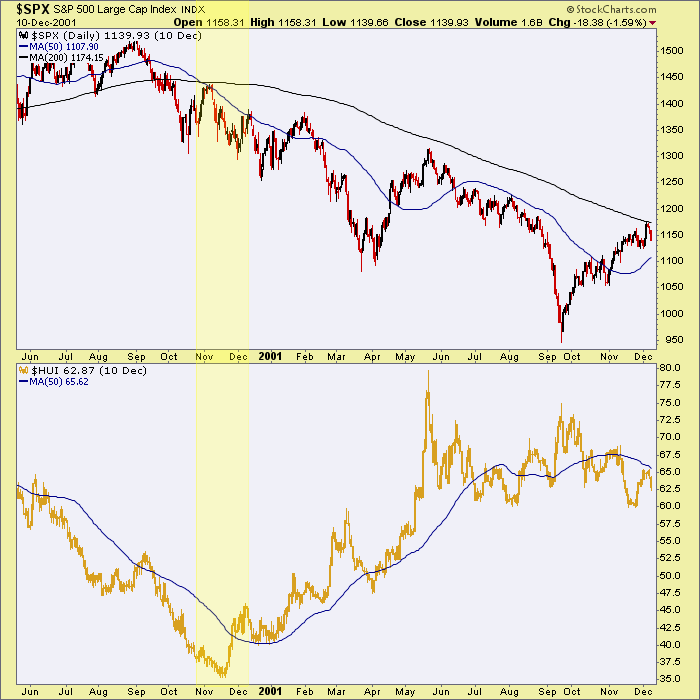 Macro fundamentals are represented by gold vs. major stock markets (and currencies, sovereign bonds and junk bonds). Gold vs. stock markets popped, dropped from the 200 day average (SPX), tested the 50 day averages and popped again. This is a ‘so far so good’ macro fundamental signal. 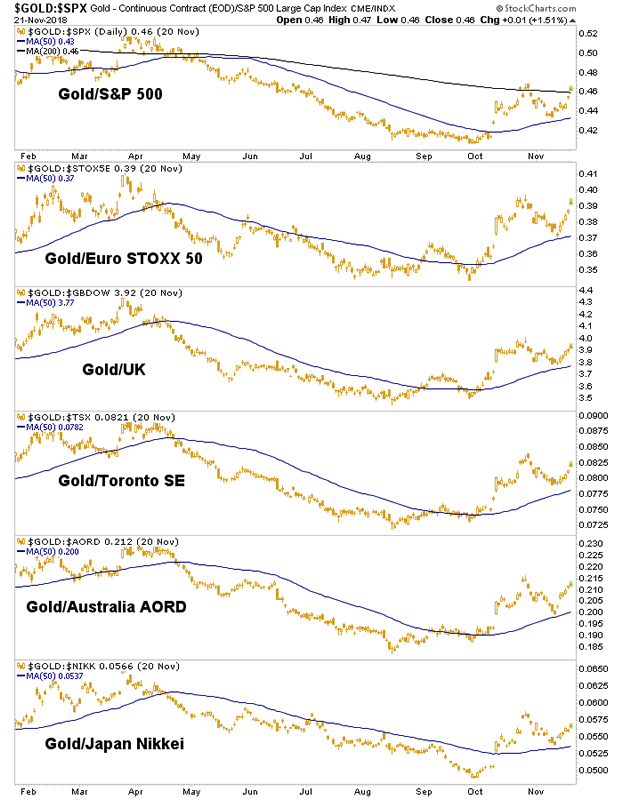 Never was the gold stock sector going to compete for casino patrons’ dollars while risk ‘off’ gold under performed major stock markets on the macro stage. The other day I wrote about a noticeable lack of enthusiasm across the gold “community” and that too is a good sign. When all you hear are crickets instead of strident gold bug warnings of an inflationary bonfire, it is time to be ready as a buyer. The heretofore strong US dollar has served us well in that regard. When you are buying, you want to feel lonely, and Uncle Buck seems to have cleared ’em all out. Well, that and tax loss selling season. For me buying is a process and I am trying to have patience and buy the best situations on opportunity. As in Q4 2008, a neat decade ago when it was lonely indeed, it does not feel today like buyers have much company. That is as it should be, especially when the fundamentals are shifting in our favor. This note from a reader tells what you need to know about the 2008 experience. In Q4 2008 I was catching falling knives, getting my fingers cut off, growing new ones and buying some more because the fundamentals were slamming into place at breakneck speed. 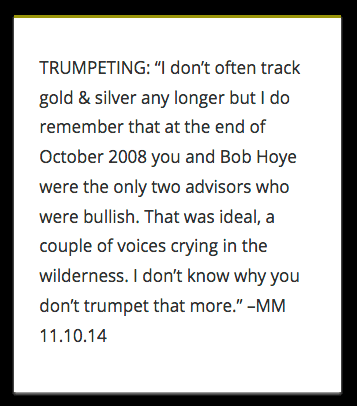 My bullishness only increased with further declines in gold stock prices, because… the fundamentals! The current situation is slower, more orderly and feels a lot like the year 2000 when SPX topped out, tested its breakdown and HUI took the other side of the trade to begin a massive bull market. We’ve been using this chart in NFTRH to gauge the 2000 situation, compare it to today and have us prepared with an analog of how things went back then under similar circumstances. As for technical analysis, we are charting gold, silver, indexes/ETFs and individual miners each week in NFTRH to functionally guide the process. Decide whether you agree that the fundamentals are coming in line and consider joining the best of breed market service that effectively manages for its subscribers macro changes like the one that appears to be taking place right now. No rotten turkey here. Just the real thing.